Charmed Bookshelf is a brand new book subscription that sends out New Age books and items to compliment the reading materials. There are three different subscription types to choose from – the “Enchant” box ($37 + shipping/month), the “Enlighten” box ($37 + shipping/month), or a box that sends everything from the first two boxes ($69 + shipping/month). The “Enchant” box is centered on Wiccan/Pagan reading material and items, while the “Enlighten” box is centered on crystals, chakras, yoga, etc. and it is a great plan for those who are just starting to discover New Age subjects. For December, I received the “Enchant” box. It came in a white box with Charmed Bookshelf’s logo on it, and I just had to peel the logo sticker off of the box and keep it because it is too adorable. 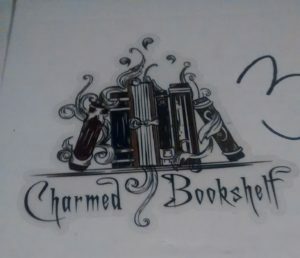 Charmed Bookshelf announces the book choices before sending them, but the items that go along with the box are a surprise. 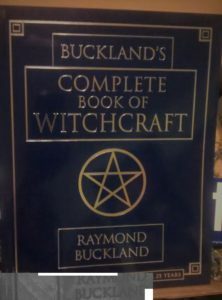 This month’s box featured Buckland’s Complete Book of Witchcraft which is one of the most beloved books in the Wiccan community. It is essentially a course in Wicca and I was very excited to receive it because I did not own it before. The version sent is the updated anniversary version, and I love how it has extensive information on the history of Wicca and Witchcraft. The book is very large and a great item for those new to the craft to learn the techniques and intricacies of the religion. However, it is also wonderful for seasoned practitioners to have in their libraries. When opening the box you first see a small art print with the Wiccan Rede on it. I love this item because this is the rede that Wiccans live by and it is great to put on your altar. I have already placed it on mine, and I love the peace that it brings to the room. A holiday card and candy cane were also included this month due to the holidays, and we also received a bookmark with the packing list of the box printed on it. The first item included was a bird feather. Feathers are very important when practicing Wicca or witchcraft, and I thought that it was a great item to include in this box since it is essentially a starter kit for Wicca and witchcraft. I already put it on my altar! The next items include was a sage smudging stick. 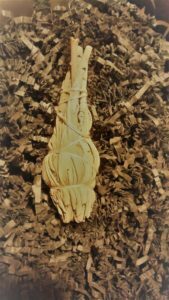 These can be used to cleanse the air of negative energy in any living space, and like the feather, it is perfect for beginners to have in their possession as it is used in different spells and rituals. 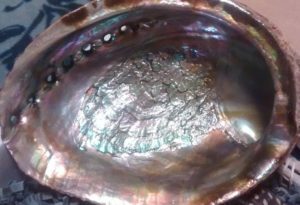 This beautiful abalone shell was also included, and it is my favorite bonus item in the box. It is perfect for your altar, and it is very large! It is another great beginner gift, and it corresponds with the book perfectly. The last item included was this coexist bumper sticker, and it is one of my favorite bumper stickers that has ever been released. 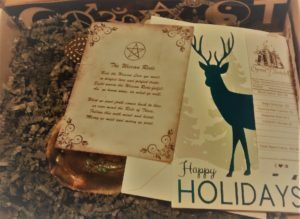 It reminds us all to accept each other for who we are, and the sticker is perfect to go along with this intro to Wicca box. Overall, I loved this box! Even though I have been practicing Wicca for many years I found this box to a perfect addition to my collection, and I was not let down. The items included were highly functional and coincided perfectly with the box. Christina’s curation was spot on, and I think that everyone who is interested in Wicca or witchcraft would benefit greatly from this box. Her box doesn’t popularize Wicca or witchcraft, but it takes it seriously and I am so happy to have found a box that celebrates the craft in a positive light.